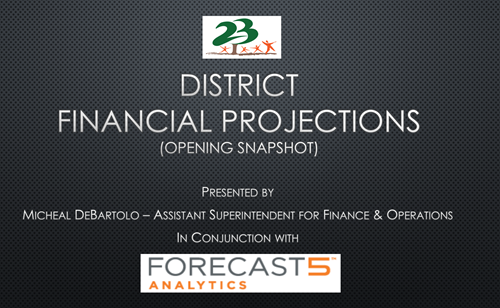 Assiattn Superintendent for Finance and Operations, Mr. Micheal DeBartolo, shared the following presentation with the Board of Education at the January 2019 meeting. This is an annual presentation that provides the current snapshot of District finances and projects fund balances for the upcoming five years based upon set assumptions. This information is the first step in planning the budget and staffing for the next school year.